Indian food Odyssey was the theme for BM #39, where we showcased dishes from all the Indian states. That was the time I had bookmarked so many recipes from all the states but never really got to make any of them. The bookmarks stayed through all these years and a few months back when we were making the plans for flatbread theme, I looked into the bookmarks and found this one! This Lesu is a very interesting recipe! It comes from the Garhiwal and Kumaon regions . Ragi flour is used as a stuffing here and it is best suited on winters as Ragi is said to be a heat producing food. Even though I had this bookmarked eons ago, I was not sure how the ragi would taste in the filling and what would be the outcome of this reicpe. I made it is for breakfast this morning. Yes for the past few days,the posts are straight from the pan to blog! I will save the rest of the lamenting for another day though. As I was making this, I was constantly thinking of how it would taste and the suggestion I has seen on many sites was to serve it with ghee. I was still apprehensive so I decided to go with yogurt and pickle. I liked this combo and it did not taste as bad as I thought it would.It also tastes good with the regular vegetable Kurma. It is very filling. I had just one lesu and a cup of coffee and I was full! I had made a few extras and even around lunch time, the lesu was soft and did not turn hard as I expected! So here is the Lesu recipe from the Uttarkhand cuisine that I have had in my bookmarks all these years! For the outer dough, take wheat flour and salt in a bowl and mix well. Add water little by little and knead well to a smooth non sticky dough.Add a little oil and knead once more and keep aside. For the filling, take ragi flour and ajwain in a bowl. Add salt and water little by little and knead to a dough. Take a golf sized ball of wheat flour dough and flatten it a little. Keep a smaller ball of ragi dough in the center and bring the edges together. Flatten the ball and and roll out into 4″ paratha. Cook on a heated griddle till brown spots appear on both sides.Remove from griddle and repeat for the remaining dough. Serve with ghee / a side of your choice. Flatten the ball and and roll out into 4" paratha. Cook on a heated griddle till brown spots appear on both sides.Remove from griddle and repeat for the remaining dough. I totally relate to that PJ….am sure my bookmarks are older than my daughter. Got to do them sometime soon. So glad you found this one just in time for the mega BM….it looks amazing. Seems like the perfect way to get my daughter eat some raagi! Bookmarking! Let’s not talk of Bookmarks , it gives me jitters . :(( ! I remember Lesu , even I was very hesitant while making this , but it’s a healthy bread and it looks very interesting too . The dark Ragi peeping out under the plain flour , somehow I liked this bread ! Omg, bookmarks, i have more bookmarks than my cookbooks. And i have even bookmarked this lesu, am yet to make them. Wonderfully rolled lesu there PJ.. Nice choice for L.
That is a unique find PJ. The filling with ragi must make it a healthy and nutritious bread. Wow! that is a wonderful find, PJ. I don’t even remember my bookmarks anymore they have totally become unmanageable. These Lesu sound wonderful and a great way to incorporate ragi in our diet. Wow ragi in a recipe is simply innovative. Awesome, healthy and delicious .. Such interesting and unique recipes we all are learning from this Mega BM. 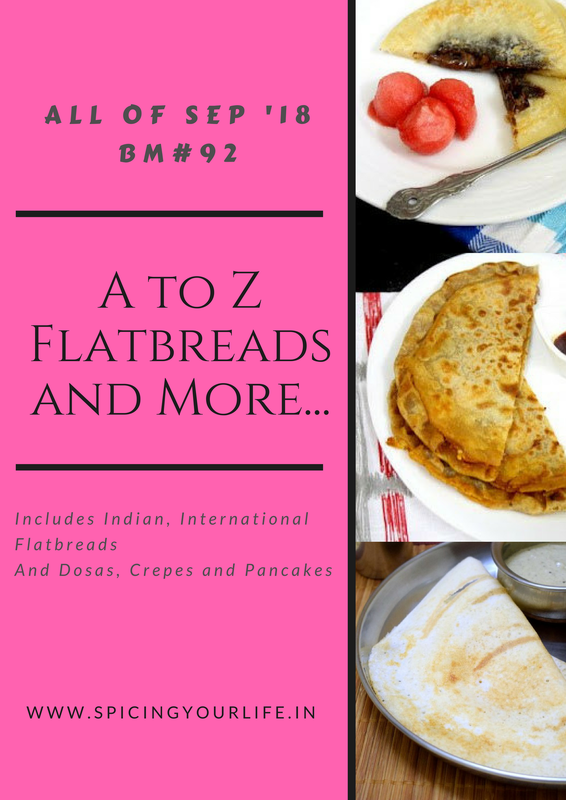 I would have never thought that there would a paratha which is stuffed with ragi! Makes me more confident to try out this recipe as you’ve already made it and tasted it Padmajha. I have bookmarked recipes on all my computers (at least 4 of them) and I even have some transferred to my external hard drive when one of my laptop crashed. This is such an interesting bread. never heard of it before and it is so different. Making from your bookmark is such a fantastic feeling..and good that you finally crossed it off your list. This one is a fantastic as this paratha tastes great with just a pickle too. I have heard about lesu from one of my friend whose husband belongs to Uttrakhand, but never thought of making it. By looking at your post, I’m thinking of giving it a try now. I am in love with this lesu paratha recipe. stuffing ragi in dough never thought about it. surely a must try recipe and so healthy at the same time.